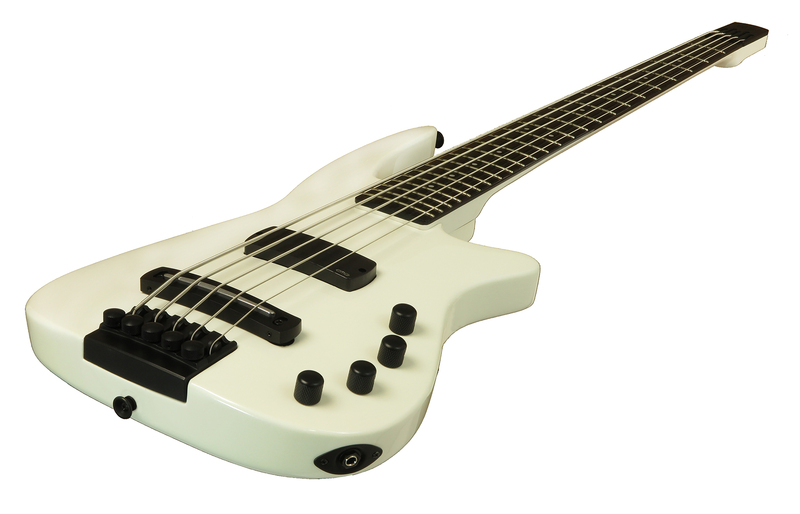 TheNS Design WAV5 Radius Bass Guitar Metallic White- every time you pick it up It’s in the feel of the instrument before you plug it in, and it’s embodied in the tone, performance and possibilities when the house lights go down. Among the advantages of a headless bass are weight and balance. The RADIUS body contours to your torso, your hands fall naturally into place, and there is no neck dive. It feels extraordinarily secure and comfortable. Available in 4 and 5 string models, the WAV RADIUS has an expansive, practical tone palette, stage-ready in any venue. A tight, rock-solid low end underpins the exceptional clarity and harmonic integrity carried throughout its range. It’s one of the differences you feel the moment you plug it in. The intonation is spot-on, through to the 24th fret. When you need it, quick, precision tuning is at your right-hand fingertips, readily adjustable even while you’re playing. Finally, an intuitive, straightforward control setup lets you find your voice (no matter what you play), or shift gears with freedom to explore the broad sonic territory provided by the NS WAV RADIUS Bass. NS RADIUS NECK: The headless, one-piece bolt-on maple neck has 24 frets, a 34″ scale for the WAV4 and 35″ scale for the WAV5, and a familiar 15″ radius. A volute provides thumb reference at the nut. String slots in the aluminum headplate eliminate the need for a headstock with heavy tuning machines. Conveniently accessed from the top of the neck, the heavy-duty aluminum double-action reinforcing truss rod, with its patented differential thread drive, gives both rigidity and precise relief control.